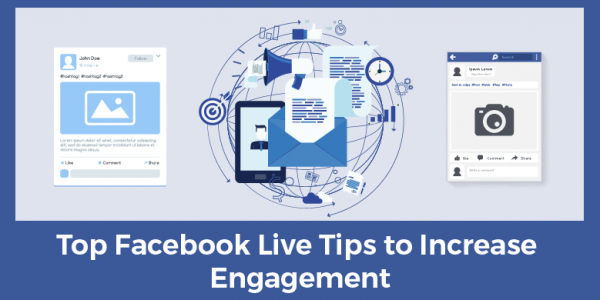 Whether you’re brand new at broadcasting Facebook Lives, or a seasoned veteran at pressing the “Go Live” button, you always want to ensure your Facebook Lives are creating as much engagement as possible. Because as you probably know, engagement is the name of the game. It’s one of the primary factors in who actually sees your posts and how many users you’re able to reach—both in terms of organic and paid traffic. Simply put: the more engaging your content, the more effective you’ll be at spreading your message. Below you’ll find 6 tips I’ve gleaned from analyzing the changes Facebook’s making to their platform and algorithm lately. These tips are a little different from what you might have already heard, and I’ll show you how you can think about them in the context of Facebook’s goals. It might seem basic, but it’s a good practice to describe your Facebook Live to generate curiosity. So don’t go live without first providing a thorough, curiosity-provoking description. Because in order for people to actually watch and engage with your content, they’re going to have to actually click on your broadcast in order to listen. So, hint: you have to give them a compelling reason to click. You need to give them a little bit of a preview, in order for them to want to stick around and watch. Use your description to entice them to join you on your live—think of it like the title of a blog post! But, you may not intuitively start your broadcast as engagingly as you should. Well, when you press the “Go Live” button, no one’s on yet! You can’t see any viewers; nothing’s happening. You wait to see people join you live, which is a normal reaction. But if you’re not careful, a few minutes will go by without you getting into the meat of your content. That’s a big problem, because you want to make sure your live notification means something for your audience. When your live notification goes out into “Facebook land,” you want it to mean something to your audience. That means you have to be excited, entertaining, and engaging with your content the moment you hit the “Go Live” button. Don’t wait a minute or two until you’re warmed up! You have to be ready to go. It’s critical to warm your audience up and train them to engage with you. If you’re doing Facebook Lives, you probably know the specific language and tactics people use to create engagement. People might say, “Drop me a one,” or, “Drop me a two,” or something similar. Now, I’m not saying don’t do that. Lots of people are using that same type of language—me, included. What I’m suggesting is that you tweak your language in your Facebook Lives to create help inspire people’s interest. If people hear the same language all the time, they’re going to tune you out. You want to stand out from the pack. If people get bored with the language you’re using, they just might stop watching. Facebook Live also has something called “Discussion Mode,” which gets triggered when the comments reach 100 characters or more. When that happens, you start to get more reach on your Facebook Lives. It may take some time to get your audience into Discussion Mode. Let’s say you’re talking in your Facebook Live about a challenge that someone’s facing, for example. Normally, that won’t be a one-character comment – it’ll be at least a sentence, maybe more. That will trigger Discussion Mode and give you more reach. You might feature a word of the day, a color of the day, or maybe a filter of the day, or something similar. They get visual attention on Facebook, so they’re a really good thing to use on the Facebook Live platform. Let’s say you and your audience had a filter of the day, maybe even some type of hashtag that’s in line with your branding. You’re creating originality; something around you that’s not only branding you, but also generating a lot of interest for people. You probably have a best friend, a partner, or a spouse. You might have a special “thing” with that person – a favorite movie, a favorite song, a favorite joke, or something like that. Think about creating some kind of special “thing” with your audience. For example, every time you go live, you might start with a secret handshake and everyone has to drop an emoji related to a handshake. Think of something creative that will get people excited about wanting to join you live. It’s not just that you’re going live to explain another topic. Creating that special interest and sense of community for people can go a long way. Watch out where you put links – don’t put them in your description or as the first comment in your Live. Think about the context of what you’re doing on the platform. When you drop a link in your Facebook Live description, it triggers the Facebook algorithm as a link post. Facebook gives link posts less reach, because its goal is to keep people on the platform as long as possible. If you’re sending viewers to a link to a webinar, a capture page, a blog, or anything else like that, you’re driving them away from Facebook. And Facebook doesn’t like that! Don’t put a link in the very first comment, either! Because there’s an algorithm for that, too. Instead, go live, finish the live, and then edit your Facebook Live afterwards. Then, after the live is over, after all of the comments from your audience, then you put the link in. Following this advice will help with reach, if you’re trying to get a link out there to promote something. When the time is up, you change the sharing settings on your Facebook Live to “Only Me,” so only you can view the content. When you do that, you’re creating scarcity. That builds you up as an authority in your space. What do these tips mean for the future of Facebook? Whenever you’re posting, you always want to think about the goals of Facebook. What are they transitioning towards? What are they transitioning away from? I’ve noticed micro-changes in Facebook’s focus, and as a marketer, it’s crucial to keep up with what’s happening. You can still generate reach with fan pages, but Facebook is deprioritizing them. Facebook is focusing more on Groups and community-based content. So when I’m talking about creating a “thing” with your audience, or creating a culture, or a color of the day, a filter of the day, the commenting, the Discussion Mode, and the comments…how does that help Facebook? Facebook is now focusing on trying to bring the world closer together, to connect people, to have meaningful relationships, to have communities of people. Keeping Facebook’s goal in mind must influence all the choices you make in your marketing. If you’re posting things that aren’t bringing the world closer together, that aren’t building relationships with people, or aren’t talking to people in the way that they should be talked to, then you may find that your engagement over time decreases. The algorithm is here to help you, but the algorithm needs you to help it. Which means that meaningful content will get the reach – and content that is not as meaningful will not. It’s important to understand Facebook’s core purpose and goals, where they are going, and how they want people to use the platform – which is to build connections, culture, and a sense of community. As you might have guessed, this has big implications for anyone looking to generate traffic traffic. Messenger is a hot topic these days for all the right reasons—it’s a perfect medium to meaningfully connect with your prospects, build trust, and discover how you can best help solve their problems. 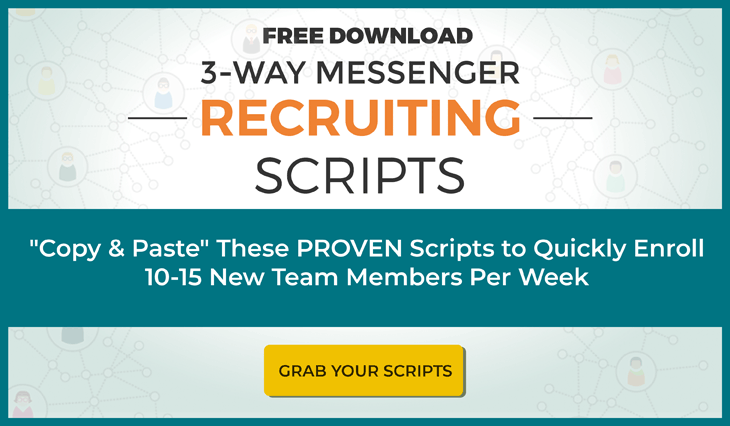 So if you need any help getting started, I recommend picking up my friend Julie Burke’s 3-Way Facebook Messenger Recruiting Scripts, which is 100% free. These PROVEN scripts to quickly create rapport, without being “spammy,” pushy, or sounding like an infomercial. This is the exact method Julie used to sponsor 270+ reps and grow a team of 8,300 distributors, all from the comfort of her home, in just 3 years, all while being a mom of two boys. Then make sure you click here and grab your free copy today!